SARAH CHALCROFT (Artistic Director) is an actress and theatre maker from the UK who relocated from London to Chicago to continue her theatrical adventures in 2012. Sarah holds a First Class honors degree in Contemporary Theatre Practice from De Montfort University, Leicester. She is an Associate Artist of Bard in the Botanics, a founding member and Co-Artistic Director of sparkleDark Theatre Company, and also sits as an Advisory Board member for Bag & Baggage theatre company in Oregon. As an actress Sarah has worked with companies all over England and Scotland. Chicago credits include The Dream of the Burning Boy & Our New Girl at Profiles, the Narrator and Ms Crumb in A Christmas Carol at The Goodman Theatre, and Galactia in Runcible's Scenes from an Execution. Most recently she was seen playing Diana in ​King Charles III at Chicago Shakespeare Theater. Sarah is a proud member of Actor’s Equity. Visit Sarah's website. Andrew is a director and actor who has bounced back and forth from both sides of the pond. Originally from Houston Texas, Andrew studied at the Royal Conservatoire of Scotland and lived in the UK for eight years. As an actor he has worked extensively with a variety of companies in Scotland and England. Highlights include Poor Boy in association with National Theatre of Scotland, The Citizens Theatre, Vanishing Point, Lazarus, Lost Theatre and The Blue Elephant. As a director he has helped develop and produce new playwriting at venues including the Rosemary Branch Theatre and Theatre 503 London. Before moving to Chicago he completed a Directing Traineeship with StoneCrabs Theatre Company in London. Andrew directed 10K, by Neil LaBute for Profiles Theatre as part of their Vices and Virtues double bill. 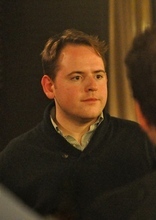 Andrew is the Executive Director of Runcible Theatre Company. Previously for Runcible Andrew directed Sweet Phoebe, Scenes from an Execution and After the Dance. NATE DION (Associate Artist) served as Stage Manager for Runcible Theatre Company's inaugural production, Sweet Phoebe in 2014. For the past two years Nate has been working behind the scenes in the Chicago theatre scene; Chicago credits include serving as Assistant Stage Manager for Hellcab, In the Company of Men, and In God's Hat, all at Profiles Theatre, and The Coward for Stage Left Theatre. Nate received his Bachelor's degree in Theatre from Central Michigan University. Nate also plays cello and is an actor. He can be seen performing the role of Sketchbook / Original Music for Runcible's upcoming production of Scenes from an Execution. OWEN HICKLE-EDWARDS (Associate Artist and Company Development Manager)Owen has collaborated with Runcible on multiple projects. Owen also created the Quotes and Queries audience development program which began in 2016. As an actor he was seen in After the Dance, Scenes from an Execution and A Number. Other acting credits include: The Aliens (Paper Lantern Theatre); The Bald Soprano (UNC Wilmington);Arcadia (UNC Wilmington); and The Pillowman (UNC Wilmington). Owen has a BA from The University of North Carolina at Wilmington, studying acting and playwriting.